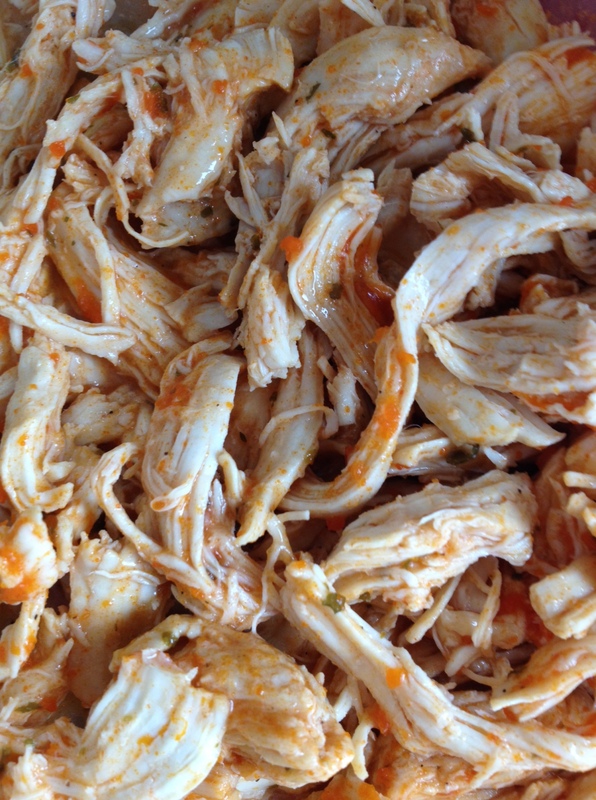 Buffalo Shredded Chicken [in the Crockpot] | how 'bout some cake? Ever since I started making this chicken recipe, my fiancé has been obsessed. It’s a household staple- it’s always in our fridge. But I’m the kind of girl who gets burnt out on eating the same thing all the time so I sought our a similar, yet distinctly different way to cook chicken in the Crockpot. I think it’s almost as good as the Mexican version, the Mr. thinks it’s slightly better. My favorite thing about it is that it’s equally easy: same number of ingredients, same amount of work. All you need is a (small to medium) bottle of Frank’s Hot Sauce, chicken, and a dry packet of ranch seasoning. Mix the hot sauce and seasoning, then add the chicken. Turn to coat, and cook on high for 4 hours (longer if you’re using frozen chicken). Once the chicken is cooked, shred it with a fork. Ta-da! It’s done. The recipe source suggests adding a couple tablespoons of butter, letting it melt in, and stirring it but I’m not convinced it’s necessary. J’s been eating it plain, but I like it over chips with some melted cheese on top. I see a million Superbowl party options with it. Give it a try and let me know what you think! Edit: I have re-made this recipe and confirmed that the butter is unnecessary. My fiancé can’t tell the difference! This entry was posted in Healthy meals & snacks and tagged buffalo chicken, buffalo chicken recipe, chicken, crockpot recipe, healthy dinner. Bookmark the permalink. I’m all about “set it and forget it” recipes! OMG, this sounds SO yummy and beyond easy! Thanks for sharing!! mmmm that looks super easy & delicious! must try. The mexican chicken recipe has become a go to in our house for quesadillas so now I can’t wait to try this version! Seriously, I’m about to make myself a cookbook out of all your great recipes. Erin always makes this so delicious! Looks so yummy! Maybe for tonight!!! I think I know what will be for dinner tomorrow! Thanks for sharing. Will update you on how it turns out……!! When making this do you use a certain amount of the hot sauce? This may be a stupid question, but I do not have a crockpot. I do have a Hamilton Beach slow cooker. Can this be made in my slow cooker instead ???? I honestly don’t know… does anyone else? I always thought a slow cooker and crockpot were the same thing? I have used both the same way! Thank you!! I suspected that, but I didn’t want to say it and be wrong! I have this in the crockpot now for lunch. Im gonna serve it on slider buns and sides of cole slaw and raw veggies. how spicy is it? my teenagers will love it not sure about my 8 yr old. or does the ranch cool it a bit? was it good on buns? I have buns here & I’m making it today… I thought about serving on buns with some feta or cheddar on top. Is this too spicy for kids? Probably not, but I’m not exactly an expert on children. On a scale of 1-10, it’s probably a 4 or 5. Is there a way to make this without ranch powder? What could I substitute? My husband hates ranch, can I substitute with something else? Like italian seasoning or something? lol Does it even have a ranch taste? I don’t think its TOO spicy. I’m thinking of trying this for Super Bowl Sunday but I’m stumped on what we would eat it with…rolls, tortilla chips? Any ideas?? I’ve had it with tortilla chips and it was delicious! Maybe melt some cheese over top? Well, it depends on your crockpot. I’ve found that I can use up to 6 and have good results. I recently tried 8 and my fiance (the only one who ate it) said it tasted fine, but it didn’t look as good as usual. This recipe is ALWAYS in my fridge now. I’m tired of it but my fiance eats it ALL THE TIME. We’re making this tonight! It’s in the crock pot right now! Do you know the exact time to cook with frozen chicken? I set my crockpot on 8 hours if the chicken is frozen. Finally made this tonight and it was great! I don’t have Ranch seasoning mix, can you use dressing out of the bottle? Im trying a variation on this tonight. I used buffalo wing sauce instead of hot sauce and sour cream instead of dry ranch. Im hoping it turns out like a spicy creamy buffalo chicken pasta sauce. Thanks for the inspiration. Trying this for the 2nd time. My kids who are 9 & 12 loved it. I don’t like ranch or spicy foods but absolutely loved this chicken! I made this today and it was soooo good! My whole family loved it! Thanks so much for the recipe! Should I use the whole bottle of hot sauce? I am trying this for dinner this evening. I have some very picky teenage boys so I hope its good. They both love spicy so I have that in my favor. We’re gonna do shredded buffalo chicken sandwiches and fried potatoes. Fingers crossed!!!! Just bought a crockpot today and want to try this! Any way to make it spicier? I’m about to put this in my crock pot so it will be ready for Super Bowl kickoff. I’m thinking it will taste great as the orange hue of the sauce (maybe) gives the Bronco’s a slight edge? Looking forward to trying it! Do you know how much longer if you use frozen chicken? put it in for 6-8 hours, depending on how much chicken you’re using. For 4 breasts, I’d say 6 hours, for more than that, I’d say 8. Hope you enjoy it! Does it matter if it is Red Hot WINGS sauce? HI Paige! I don’t know, I haven’t tried it. Sorry I can’t be of more help. I did it, and its very easy and turned out awesome! I just threw this in my crock pot. Used 1 pound of chicken, about 1/2 bottle of baby ray’s buffalo wing sauce, 2 packets of ranch and a couple dashes of cayenne pepper hot sauce. I put my crock on my on the low setting so it can cook all day while I’m doing house work and running errands. We’ll see how it turns out! Can I use bone in chicken breasts with the skin on it? I’ve never tried, but I bet it would work! The chicken is tender at the end so I think you’d be able to pull the bones out easily. I haven’t tried it, but I bet it would work. 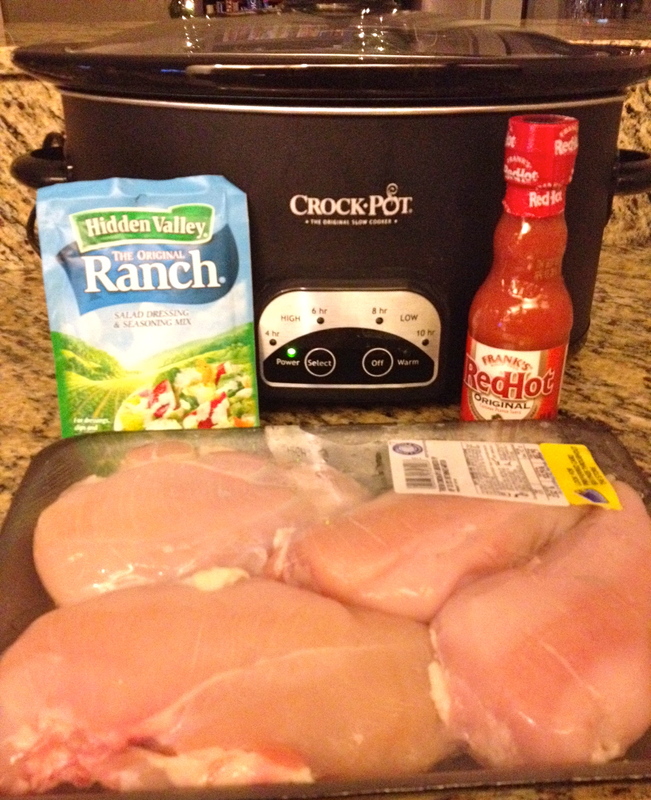 This is one of my favorite crock pot recipes. We have it as a sandwich with a side salad for dinner. Then I eat left overs all week because it’s so addicting! I love it on salads too. Thanks!! I am going to use this for a base for my lasagna roll ups!!! I can’t wait to try this! Thank you for the comment on the butter, why add it if its not needed. Any suggestions for using frozen chicken breasts? I’m new to cooking with crockpots but definitely love it. I just Find the sauce is getting watered down from the chicken. Made this 2 weeks ago for dinner and yesterday my husband asked if I could make it again. He can be very picky so this is a big deal! So easy too. What can I pair the chicken with? Just chips and cheese? Or can I make something else out of it? You can also put it on salads or sandwiches. I’ve made some really yummy buffalo chicken wraps, too! Hi Rebecca, sorry this turned out poorly for you. Are you sure you used the right hot sauce? I usually use Frank’s hot sauce but they make a few different variations (like a wing sauce). The bottles look very similar – maybe you grabbed the wrong one? I made this last night and served it on King’s Hawaiian Rolls. It was a huge hit, even with my 6 year old who doesn’t like spicy stuff. We just added some Ranch Dressing to his as a condiment, and he ended up eating 3 sandwiches!